I'm FINALLY getting round to reviewing the Kylie Cosmetics Leo Lip Kit! I bought this on the first launch of the Birthday Edition, I had been waiting for a dark red lip kit as I am obsessed with the colour and I am a big fan of the Kylie Cosmetics formula. I would note that this took AGES to go through customs and probably arrived at my house almost 2 weeks after arriving in London. While this has nothing to do with Kylie Cosmetics because of the brands reputation I was getting frustrated and feared it lost. We all know how hard it would be to get a refund! Thankfully this did eventually arrive and somehow I did not get charged customs. 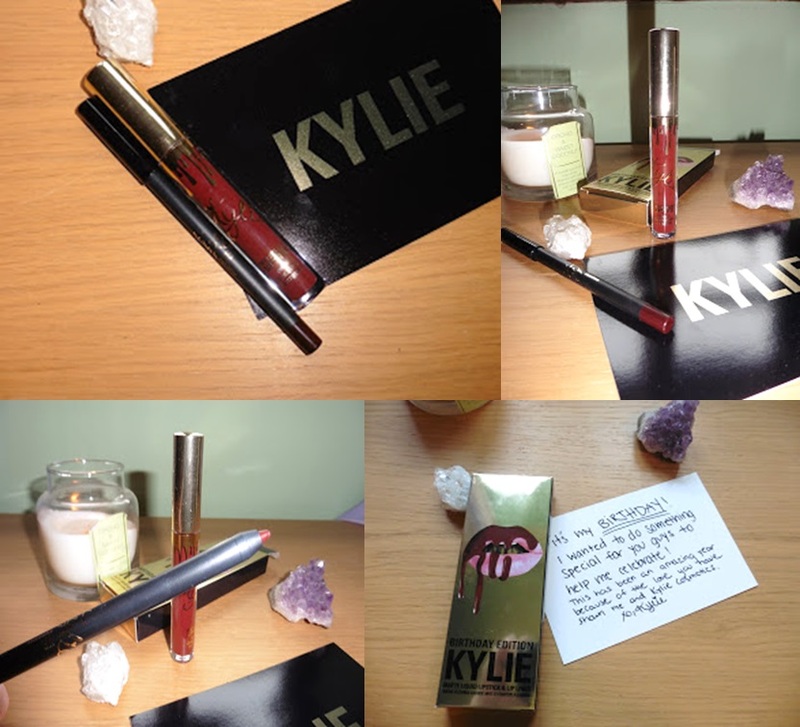 A liquid lipstick and matching liner both in the shade Leo and a different message card celebrating Kylie's birthday. For the Birthday Edition the packaging has had a change up, the liner remains the same sleek black with the colour of the pencil on the end. The liquid lipstick tube has a gold lid with the drips and and signature also being gold instead of the usual black. The box itself is a shiny gold rather than white and while this is pretty you can leave a lot of fingerprints on it. I feel this slight change of the packaging adds to the fact that these are limited edition and gives a special touch. Like the previous lip kits the formula of this one has the same strong vanilla scent (which I happen to love) if you're not a fan of sweet scents this may not be for you. The liquid lipstick is very pigmented but because of the darkness of the colour can apply slightly patchy. All you need is a few touch ups to fix this. I did find this harder to apply than Posie K because it is such a dark colour if you go wrong it is very noticeable. The formula does dry matte however when you drink from cups for example there is transference so it can smudge if you wipe your lips for example. These are at the pricier side they are about £30 for a liquid lipstick and liner which is a good price, however when you add on delivery and customs charges they can be at least £50. That's if you're only talking one lip kit. Here's hoping they get a UK stockist soon! However as a one off treat I feel it is worth it. I am obsessed with this colour but because of the transference I have given it a 4 out of 5 as the length of wear isn't as long as the lighter shades. What are your favourites from Kylie Cosmetics? Hey, would you recommend this as a birthday gift? I want to get my friend this shade (Leo) but not the birthday edition, just regular. Thank you! Apologies I didn't get notification of your comment. I would definitely recommend it as a beautiful shade and the quality is so good! !